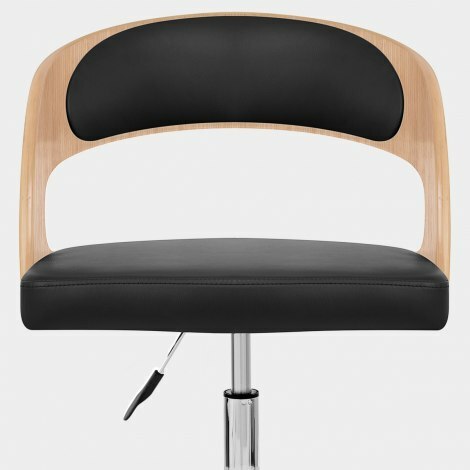 The Evelyn Chair Oak and Black is a subtle sensation. 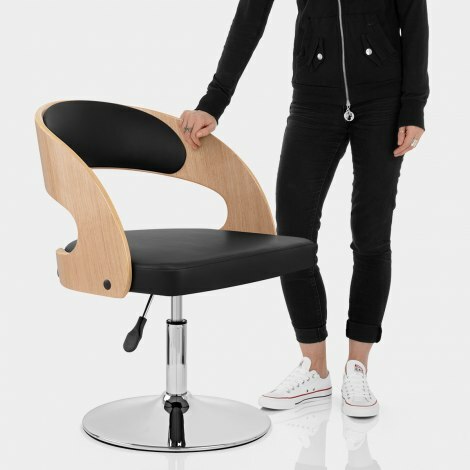 Elect the Evelyn as your kitchen chair of choice and see what it can do for you. The seat is composed of wood and leather, bringing new and old together in style. The wooden seat, which incorporates a polished oak finish, softens the faux-leather padding which in turn gives the Evelyn its contemporary visual appeal. Built to elevate the beauty of your dining room, the Evelyn incorporates a variable-height gas lift mechanism which enables users to customise the chair in accordance with their needs. 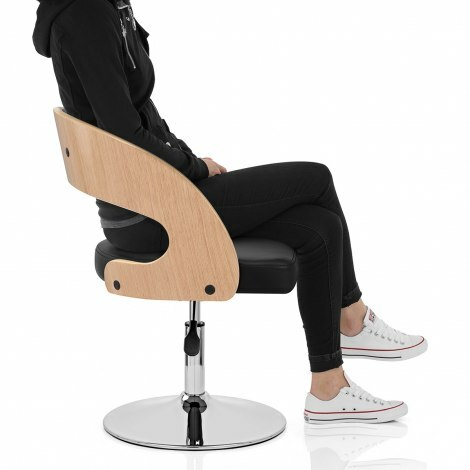 The 360-swivel function adds to this, turning the Evelyn into a chair that can be anything you want it to be. A sturdy sister to our popular Eve Bar Stool, the Evelyn is completed with a fashionably flat base and a rubber ring to minimise the risk of damage to floors. "Good chair fab price quick delivery. Thankyou"
Great chairs. Very comfortable, look good and easy to put together. Good communication with company and delivered on requested day without issue. Nicely made and simple in its design; comfortable and good value for money. Good quality chair and looks great. I especially love the non scratch base as I have oak flooring. Highly recommended. Very pleased with these chairs. They look good and are comfortable too. I bought them for the home office and like the base as it will not cause damage to my new carpet in the way that castors would. We also needed some extra dining chairs for those odd occasions when we have more people to dinner. These chairs are ideal as extra dining chairs and do not cause any storage problems as, for me, they are dual purpose. Made a cracking office chair. Feels rock solid and quality v high for the price.